TORONTO -- Matt Nichols threw two TD passes and scored another while Andrew Harris ran for a career-high 161 yards and had two touchdowns to lead the Winnipeg Blue Bombers past the Toronto Argonauts 38-20 on Saturday afternoon. The win came after Winnipeg (3-3) surged to a 17-0 half-time lead last week against B.C. before losing 20-17. But it was hardly a clean victory as Toronto (1-4) scored 19 points off three Bombers miscues. The Argos registered 11 points off two fumble recoveries to pull to within 25-12 at the half. Winnipeg countered in the third with Nichols' one-yard TD run at 4:15 and Justin Medock's 16-yard field goal at 8:58 for a 35-12 advantage. But Jermaine Gabriel returned Nic Demski's fumble 87 yards for the TD at 13:07. James Franklin's two-point convert cut Winnipeg's lead to 35-20. However, Winnipeg made it an 18-point game at 6:05 with Medlock's 19-yard field goal. The previous rushing high for Harris, the CFL's top Canadian last year, was 139 yards registered against B.C. Nichols finished 19-of-27 passing for 245 yards. Franklin completed 21-of-36 pass attempts for 151 yards and an interception. Darvin Adams had Winnipeg's other touchdown. Medlock added four converts, three field goals and a single. Llevi Noel had Toronto's other touchdown while Armanti Edwards recorded a two-point convert. Ronnie Pfeffer added a single and field goal. Noel and Pfeffer gave Toronto much-needed life late in the first half. Noel returned Kevin Fogg's punt-return fumble 49 yards for the touchdown at 14:11 of the second before Franklin found Edwards for the two-point convert. Toronto's Cleyon Laing then recovered Harris's fumble at the Winnipeg 51 with 12 seconds left. That set up Pfeffer's 31-yard field goal to end the half. 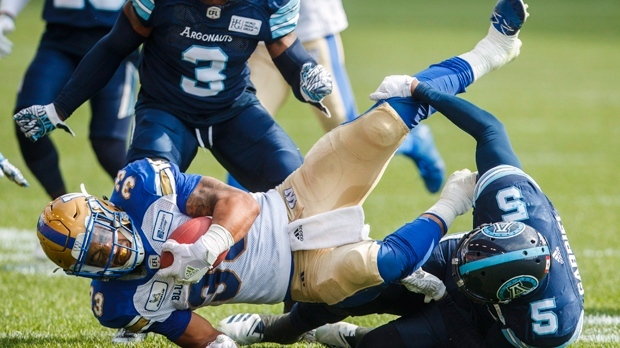 The turnovers tarnished a solid opening half for Winnipeg, which outgained Toronto 236-124. The Bombers were especially effective running the ball, gaining 96 yards on 16 carries compared to just one yard on four tries for the Argos. Toronto drove to Winnipeg nine-yard line as part of a 55-yard, 16-play drive that lasted 7:43. But the Argos got no points as Pfeffer missed a 34-yard field goal and the Bombers returned it to their 30-yard line with 4:28 left in the second. Nichols found Harris on a six-yard TD strike at 2:23 of the second to put Winnipeg ahead 22-1. Winnipeg led 15-1 after the first, scoring touchdowns on their first two possessions. Adams had a 22-yard TD catch at 2:10, two plays after Ian Wild recovered Martese Jackson's punt-return fumble. Harris capped a 67-yard, nine-play drive with a one-yard TD run at 7:50 before Medlock added a single on the ensuing kickoff. Toronto drove to the Winnipeg 20 but Pfeffer missed from 27 yards out for the single at 11:39, drawing boos from the sparse gathering.